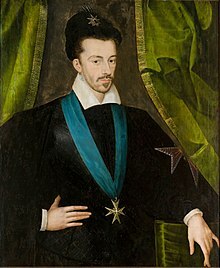 Charles of Lorraine, Duke of Mayenne, or Charles de Guise, was a French nobleman of the house of Guise and a military leader of the Catholic League, which he headed during the French Wars of Religion, following the assassination of his brothers at Blois in 1588. In 1596, when he made peace with Henri of Navarre, the wars were essentially at an end. 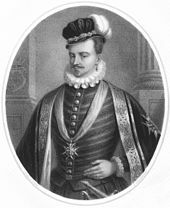 He was the second son of Francis of Lorraine, Duke of Guise and Anna d'Este, the daughter of Ercole II d'Este, Duke of Ferrara and Renée of France. 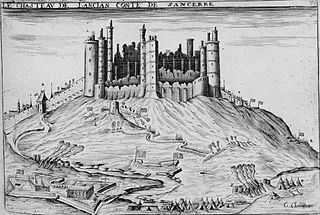 The Siege of Sancerre (1572–1573) was a siege of the fortified hilltop city of Sancerre in central France during the Wars of Religion where the Huguenot population held out for nearly eight months against the Catholic forces of the king. 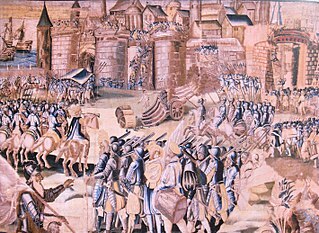 The Battle of Coutras, fought on 20 October 1587, was a major engagement in the French Religious Wars between a Huguenot (Protestant) army under Henry of Navarre and a royalist army led by Anne, Duke of Joyeuse. 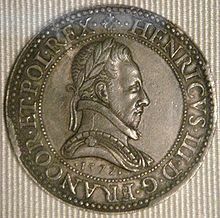 Henry of Navarre was victorious, Joyeuse was killed while attempting to surrender. Marie of Cleves or of Nevers, by marriage the Princess of Condé, was the wife of Henry, Prince of Condé, and an early love interest of King Henry III of France. 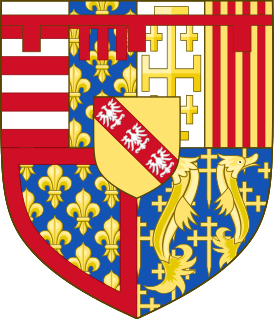 She was the last child of Francis I of Cleves, Duke of Nevers, and Margaret of Bourbon-Vendôme, elder sister of Antoine of Navarre.